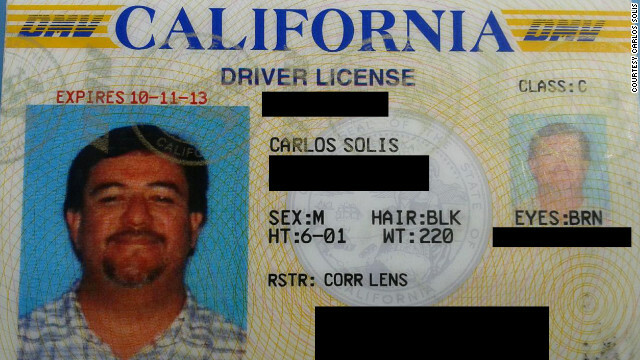 Carlos Solis' driver's license shows his reported weight, more than 60lbs less than what he actually weighed at the time. Last week, I took our daughter to the DMV so she could take her driving test. While waiting in one of their monotonous lines, I took out my driver’s license to show her. I told her I shaved the beard and mustache because I looked too much like my Uncle Willie. As we were laughing at my picture, I reminisced about when I went in to renew my license in 2008. I remembered telling the clerk my height, eye color, etc. When it was time for me to disclose my weight, a very personal bit of information, I wasn't ready. I didn't even think that question would come up. Even though it came up the last time I did this, I guess I forgot! I froze for a few seconds, contemplating what I believe a lot of us do when we’re at that place in line. I thought, “Should I tell her the truth?” Exposing to the world that I had let my body go, ending up being pre-diabetic then developing type 2 diabetes? I started rationalizing, telling myself, “Hey, this person doesn’t even know me, what would she care?” Why should I admit to my faults to a complete stranger, just make something up and hope she doesn’t question it. So, that’s exactly what I did. As you can see, my weight was listed as 220 lbs, when really I believe it was a whopping 285 lbs at the time! The incredible thing is, the clerk didn’t bat an eye or question the validity of my response. I was so relieved, she just typed it in, but inside I felt sick. Can anyone else out there relate? Wow, I am so glad I don’t have to go through that again! Next time I go in, I’ll be able to proudly divulge my true weight. All it took was a reality check from a few key people in my life to get things turned around. In less than 80 days, as I approach the finish line at the Nautica Malibu Triathlon, I’ll be leaving behind a lot of baggage. Mostly issues I have overcome leading up to this great race and then re-packing with the strength, courage and determination I forgot I had. You can follow the Fit Nation Triathlon Challenge on Facebook and Twitter. It is a license... You have it for a few years. For states that ask for weight, they don't need actual number, but as a general description on how you look like. Normally if you say you are male who is 5'6" under 100 lbs you would be very skinny person. 100 – 150 lbs a skinny person. 150-200 lbs an average size build, 200-300 heavier build, 300+ large build. Thanks for the info! I'm looking forward to telling the DMV clerk next year I'm 190lbs!! I'm stunned. Can't wait for the book to come out. Thanks for stopping by and reading my blog, I have some ideas for a book. Great story, Carlos! Can't wait to cross the finish line with you and our team mates! Gracias for the kind words buddy! 71 days, 13 hours, 17 minutes and 10, 9, 8....seconds!! Right? I've given my autograph a few times! !